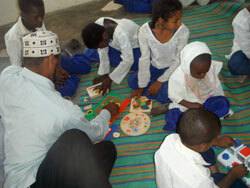 Our overseas church charity for this year is a special needs class at Pandani School, on the island of Pemba, Zanzibar - part of Tanzania. Church member Les Fry, a former headmaster, completed a year-long project on Pemba through VSO (Voluntary Service Overseas) developing education and supporting six schools there. One of these schools has a special needs class with a mix of ages and a mix of abilities and disabilities. Members and friends at Redland Park were very generous in collecting educational toys and games (and donations of money) which were shipped out to this class in January 2013 and have been used happily ever since. Les and the headteacher then agreed that what the school really needed was extra teaching resource to be able to give these children some form of education, and that is the hope of this fund-raising. £40 per month will pay for a half-time teacher who should be able to give these children a better start in life.